Though the state slogan of South Dakota above refers to a famous presidential carving, the actual number of faces living in the state is very low. South Dakota ranks 46th out of 50 in population. That means that even smaller cities -compared to cities of the same size in your state- have tons to offer culturally and shouldn't be skipped. One of those cities -which we recently had the pleasure of spending some time in- is the 4th largest city in South Dakota. That city is Brookings. As I noted, Brookings probably wouldn't be the 4th largest city in your state. 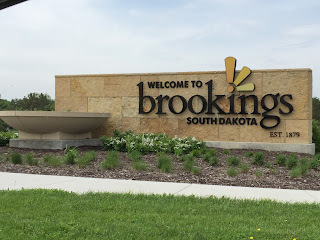 With 22,000 people it is not a metropolis, but since there are only 3 larger cities in South Dakota and it is also home to the largest university in the state -South Dakota State University- Brookings has a wealth of things to do and see. For those culturally minded travelers, Brookings is home to the South Dakota State Art Museum, the South Dakota historical Agriculture Museum, and an annual art festival. For travelers with kids, the wonderful South Dakota Children's Museum is located in town. And for those of you who travel just to check out the town itself, Brookings has one of the better preserved turn of the 20th century main street/downtown areas that I have been to. There are no empty store fronts on Main Ave in Brookings and each occupant has mixed in a little modern to go along with the traditional features of the buildings. Like any good sized university town, downtown Brookings also has a number of great bars. But Brookings also has something that not every university town has, it's own brewing company and tap room. Without further adieu, let me introduce you to Wooden Legs Brewing Company. "Hmmm...that's a funny name. What does it mean?" The city of Brookings gets it's name from an early South Dakota politician, Wilmot Brookings. I won't delve into his whole story -or the fact that he only visited the town twice- but Brookings himself lost both of his legs in a blizzard and had wooden prostheses fitted. Wooden Legs Brewing is a tip of the cap to this early South Dakota pioneer. Phew, with the history lesson out of the way let's hit the brewery. Wooden Legs is set right off Main Ave in Brookings. The brewery -like everything else in that area- is set in a reclaimed turn the of the century building. Because of different codes, the inside had what I would describe as an industrial beer hall vibe to it. It's not a wood beams and sipping by the fireplace kind of joint, but it's also not like drinking on a farm equipment assembly line. It actually reminded me of a couple places in Prague that we have had drinks in. Beyond that it's another brewery to bring the kids to because they serve food -really good pizza- and have games as well. Since we had a great place to grab a bite, entertained kids, and a menu of beer in front of us the next logical thing to do was try the beer. Like many other tap rooms that we have been to, Wooden Legs has a mix of their own brews and guest taps and bottles on hand as well. What you don't always get is true pallet analysis. As the title of this post suggests you can get a beer education at Wooden Legs. All of the servers are certified beer servers, which means if you have no idea what kind of beer you like the servers can decipher your favorite flavors into either one of the house beers or any guest beers available. It is a GREAT way to build a loyal base. I was very impressed. 1st stop cream ale. Yes I brought my matchbox cars to the brewery. I sampled 5 of the 8 rotating taps -which consisted of 5 signature taps and 3 seasonals. I was a little disappointed that Wooden Legs take on a farmhouse ale wasn't on tap when we were there, but that just means I get to head back another time for a taste. And besides they had -the ever growing in popularity among Midwestern brewers- a cream ale on tap. Yum as usual! Wooden Legs take on the cream ale was nice and light with a subtle sweetness. There was little bitterness at all making it a beer you can enjoy more than one of -whether you are just dipping your toes into craft beer or are already a local drinking veteran. The cream ale -Wild Hare Cream Ale to be exact- also was the base for another beer becoming popular in these parts, the Pub Shandy. The recipe for this style is simple, but has created an absolute summer favorite in recent years -just ask Jake Leinenkugel. Wooden Legs takes the cream ale and adds a "dash" of San Pelligrino Limonata to the batch and voila, one of the perfect hot summer day beers is born. I loved the fact that a small brewery had dabbled into this fun style. It takes some stones to occupy one of your tap lines with an off the path style, no matter if you know it "should" be popular in your region. Kudos for the stones. My other 3 were finely crafted takes on 3 completely different styles. Milk stout, black IPA, and sour. I am a stout fan -I've had stouts at every brewery they've been available at. Wooden Legs stout is low ABV and low hops making it very drinkable. The recipe was crafted by the owners while they were in Ireland together and it has a very familiar drinkability to a famous Irish stout. The sour is a style that I am not sure if I'm on board with yet. I was impressed again though that a small brewery was taking up a line with a beer that is just starting to catch on in America. I will say that I wasn't turned off and if you like sours you will like what Wooden Legs did with their wild yeast. Last but not least, the black IPA -fingers crossed that this wasn't some black hop bomb. It wasn't! It was actually my favorite of the bunch. Wooden Legs black IPA was -to me- a hopped up imperial stout. Again I am a stout fan, so having a similar style with a little more bitterness was a fun change of pace. The black IPA and cream ale should be on the top of your tasting list when stopping in. Brookings: Good people and good beer. A great South Dakota stop. Eastern South Dakota -where Brookings lies- is a different landscape than the South Dakota of Rushmore. This portion of the state is the visual definition of the Great Plains in full force. Rolling green hills and farms with lakes dotting the landscape make this area very peaceful. The people of Brookings are as down to Earth as you'll find as well, which was evident when we were chatting with Brant -one of the co-owners of Wooden Legs. One of the many things Brookings has going for it -unlike much of the state at this point- is a great spot to sit down and grab a truly local brew. No matter where your South Dakota vacation is taking you, make some time for a stop and a beer in Brookings.